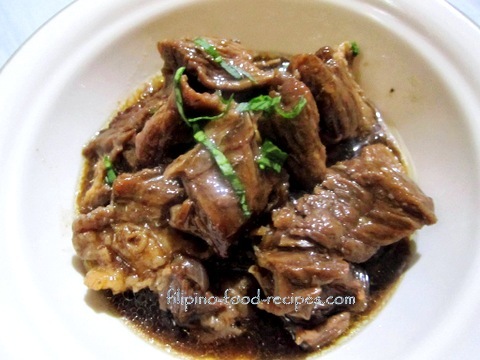 Pares - Beef Stew with Soy Sauce, Oyster Sauce, Brown Sugar and Star Anise. Pares is a stewed beef dish that is savory yet slightly sweet, cooked until fork tender, with a hint of licorice taste from the star anise. The word itself means "a pair" - that is, the pairing of the beef and garlic fried rice. It is said to have been originated from a garage-turned-restaurant in Retiro, Quezon City. Well, it became so popular in the 90's that the next thing you know, every other block has a Pares stall/turo-turo/restaurant. The taste somewhat reminds me of the filling of the siopao pork asado, except that this one has ginger and is not as sweet. 1 Brown the beef pieces in 3 Tbsp. hot oil, then remove the beef from the pan. 2 Using the same pan, saute the garlic, onion and ginger. Add the beef, soy sauce, brown sugar, star anise and enough water to cover the meat. 3 Bring to a boil, then simmer at medium heat for about 1 1/2 to 2 hours, or until beef is tender and with about 2 - 3 cups broth left in the pan. 4 Add the oyster sauce and salt and pepper to taste. 5 Thicken the sauce with cornstarch slurry. 6 Garnish with spring onions and serve with garlic fried rice.